Gigi Scaria, Core, 2017. Watercolor on paper, 40 1/2 × 28 1/2 in. Talk about urbanization to any Indian artist and they will probably get their hackles up. Rapid expansion and accommodation for India’s growing merchant and professional class has led to the wonton demolition of old buildings and historical architecture. Furthermore, swift encroachment on agricultural and rural populations has outstripped the provision of housing for the dispossessed. For many artists, this contentious subject matter has become the mainstay of their practice as they hold a mirror up for the rest of us to see what exactly is taking place. 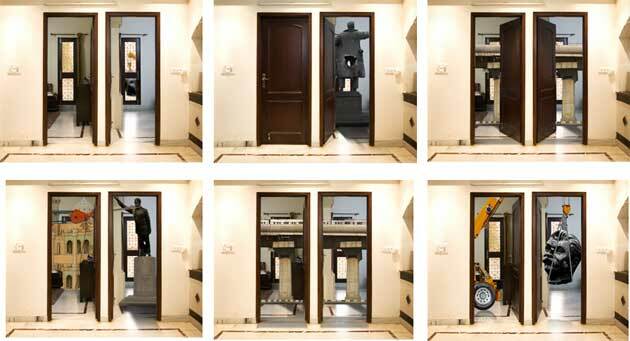 In the first major U.S. solo exhibtioin of the New Delhi-based artist Gigi Scaria (b. 1973, India), All About This Side in Aicon Gallery in New York, photography, painting, video art, and sculpture explore and depict this sense of social dissonance. Scaria’s training in his native Kerala, which emphasized forging a socio-political connection with one’s environment, became entrenched in his practice once he moved to Delhi in the mid 1990’s to pursue a master’s degree in fine art. In the meantime, Delhi’s urban sprawl hastened by India’s globalization in 1990 had begun. Tall buildings lined the horizon and gave a modern look to the city’s skyline. Scaria’s images of his new hometown could well be the thriving city of Dubai. But in reality, many of these protected, fenced in buildings housed communities of the well heeled determined to keep those who are economically deprived at bay. In Fragmented Reality (2017) and All About This Side (2017), Scaria’s photographs delineate Delhi’s divisive housing situation. Shot with a wide angled lens, the nine and fifteen foot long narrow strips of inkjet prints of the city on archival paper convey two different scenarios existing side by side. In the first image, we see a burgeoning cityscape with all the promise of prosperity highlighted by the azure sky, and in the other, printed in subdued sepia tones, we see a dilapidated shantytown segregated by a fence. Scaria’s documentation of these starkly opposed living conditions that are as aesthetically compelling as they are distasteful not only encapsulates the divide between the haves and have-not’s, but it also portrays the complete lack of concern for the disenfranchised on the other side of the fence. Unlike some artists’ more militant stance against these societal inequities, Scaria’s paintings have a farcical take. 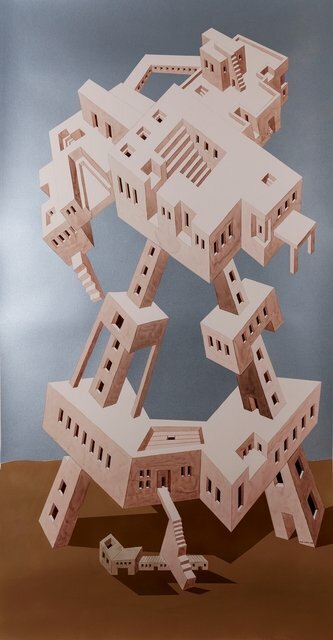 Here in a series of watercolor works, outrageous architectural constructions of futuristic housing take potshots at contemporary design as well as the absurdity of what money can buy. 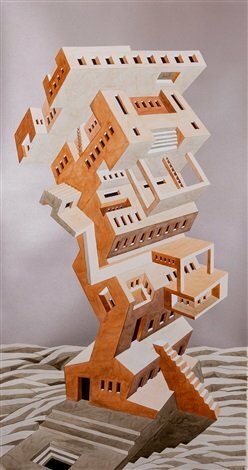 Fashionably tilted buildings and contorted angles that would make standing on a flat 180 degree horizontal surface seem both horribly mundane and utterly impossible appear in Uncertain Terrains (2017) and Ladders of Gravity (2017). 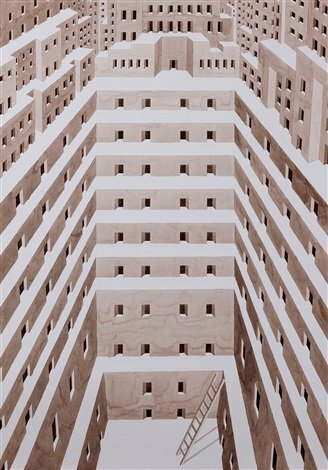 In other works like Core (2017), eerily surreal panopticons conjure a state of constant surveillance and security for those in the gilded world of Delhi’s high society, and at increasingly gentrified neighborhoods the world over. Scaria’s watercolors appear to be a continuation of his earlier Lego sculptures that lampooned imaginary hyper-mechanized societies. Alluding to the displacement of a simpler way of life, and with it the eradication of an older civilization. This idea becomes more evident in his highly poetic single channel video, Shadow of the Ancestors (2015). Contrary to his previous more satirical videos, the large-scale projection of a hefty wooden stump in an open unscathed landscape that is slowly imprinted with the structure of a high rise is perhaps Scaria’s most subtle video yet. Through its alluring minimalist imagery, the video deftly conveys the gradual transformation of a basic holistic society to a more complex hierarchical one without any underlying references to political ideologies. However, the very criticism that has been leveled at Scaria’s prior videos like Political Realism (2009), for being too obvious and didactic can be directed towards his sculptures in this exhibition. 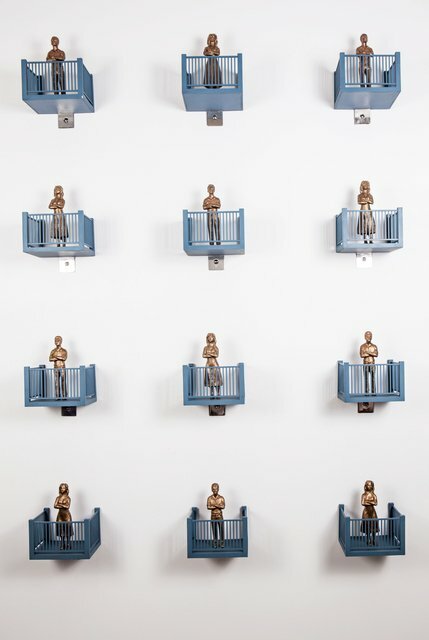 Perhaps the least successful of all the mediums in the show, Scaria’s works like Trial (2017), comprising of a series of balconies ostensibly jutting out of a high-rise building with angry bronze figures placed in each one of them is a statement about the urban elite who must be held accountable. 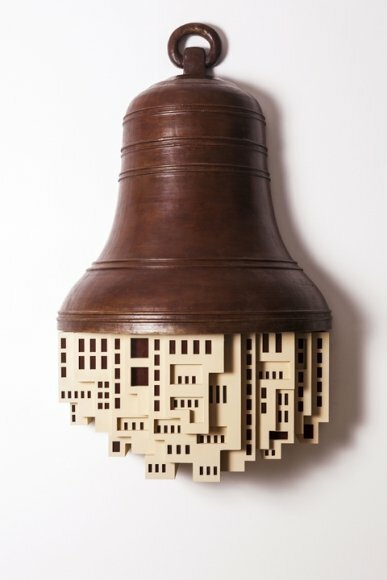 Even Scaria’s sculpture Scream (2017), made up of plastic buildings hanging from a large bronze bell is a symbolic death knoll for the escalating injustices of Indian society. But, be that as it may, the likelihood of Scaria’s voice as an effective activist and naysayer is at its best when he combines his subtle poetic vision with his most stringent critique of a country sliding towards disorder. Gigi Scaria was born in Kothanalloor, a village in southern Kerala, India, in 1973. In 1995, after completing a Bachelor of Fine Arts degree at the College of Fine Arts, Thiruvananthapuram. Scaria moved to New Delhi where he undertook a Master of Arts at Jamia Millia Islamia. In the mid-1990s, while establishing his career as a professional artist, Scaria also illustrated children’s books and taught art at an experimental school in New Delhi. Since 2001, Scaria has held over fourteen international solo exhibitions. In 2010, Scaria participated in West Heavens, the first major artistic engagement between India (historically referred to as the West Heavens in Chinese Buddhist texts) and China. The exhibition Place Time Play: India-China Contemporary Art, was displayed at various venues by the Shanghai International Culture Association, Institute of Visual Culture, China. The following year Scaria was one of five artists (with Zarina Hashmi, Sonal Jain, Mriganka Madhukaillya and Praneet Soi) to represent India at the54th Venice Biennale in the exhibition Everyone Agrees: It’s About to Explode, curated by Ranjit Hoskote. In 2011, Scaria’s work was presented at the 3rd Singapore Biennale as well as in Crossroads: India Escalate for the Prague Biennale. Scaria’s first project for an American museum, Gigi Scaria: City Unclaimed was held in 2013 at the Smart Museum of Art, the University of Chicago. A large photo-based mural of an imaginary cityscape, and a 3.6 meter high water fountain were sited in the museum’s reception for twelve months. In 2014, Scaria participated in Kochi Muziris Beinnale titled Whorled Explorations curated by Jitish Kallat. In 2016, he has exhibited a large-scale steel sculpture at Laumeier Sculpture Park, St. Louis, USA. At the same time he also had a solo exhibition Time at their art center.